Rob took up fly-fishing after inheriting his grandfather's flyrod. Disappointed with store-bought flies, he almost immediately began tying his own. Now a commercial tier, Rob uses techniques and materials that suit his artistic preferences and ties patterns that are frequently out of the ordinary. Tying Tip: Rob coats the finished "hump" with lacquer to add durability. Something strange happens on the road out of Gatlinburg, TN. 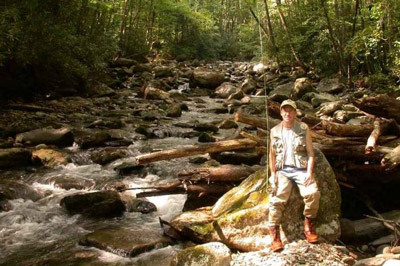 You drive along route 441, watching the inviting waters of the West Fork of the Little Pigeon River more than the road in front of you. By the time you get to the Loop where the road curves up and around over itself, time becomes abstract. The cars and tourists blur, almost slow to a stop like ethereal spirits in a foreign world. There’s no question they’re there, it’s just that they don’t matter, and they are no longer a significant part of the world into which you’re about plunge. 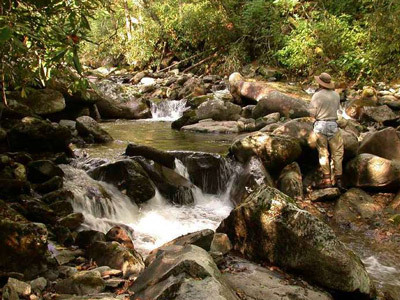 You don’t so much arrive at the Great Smokey Mountains… you melt into them. Suddenly you’re among them, and as you explore the emerald and golden waters, breath in the humid air of loam and forest, you become a part of them. And once in this state, it’s with you forever- part of your being, coursing through the blood and calling to you until you return. My friend Denver returned, and brought me with him. 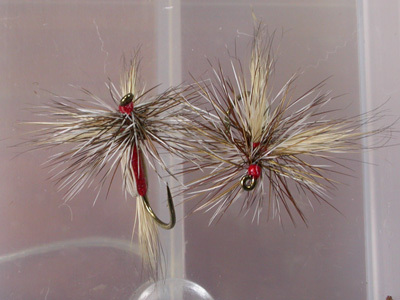 Last time he came the only good flies were #14 Red Humpies I’d tied for him. With our boxes full of those and a few other patterns "just in case", we flowed deeper into the mountains of Southern Appalachia. Sure we were driving, but that abstract sense of time and space made us feel as if we were part of the clear creeks and rivers as we back-stroked against the eddying currents and over rounded granites to higher ground and headwaters. The more water you admire, as you get deeper into the mountains, the more the feeling gets to you. It eats at you, gnaws at you, until you find yourself holding the fly box somehow and practically climbing out of the car window. It gets to be too much and you have to have release. We pulled over to toss a few flies in the river beside the road for a bit. With all this anticipation and glorious water, my hands were shaking as I tied on the first fly. Down at the water, we weren’t more than a few yards from the road, but I couldn’t hear the vast army of tourists’ cars, only the gently gurgle of the water over ancient stones in dark shadows. After the fourth or fifth cast I finally calmed down and managed to get the fly on the water instead of the trees. The water here was narrow enough to touch the other side with the rod tip, but small dark pockets and funnels behind larger rocks promised little hidey-holes for wild trout. We fooled a few, dropping the flies onto the water to run into the pockets where they’d get picked off. The trout were rainbows, wild, with rich colors of an intensity I’d never seen before. Small fish, but they more than made up for it in the fight. Born and raised here, these little guys were nothing like their sheepish stocked cousins in other waters. I don’t know where the mind goes at times like this. I stood below a small waterfall looking at the pool just above. The pool was at about the level of my chest, and looked like it might hold a good trout. I figured where I was, any fish in there couldn’t possibly know I was there. Hiding as I was on the downstream side of the waterfall, I laid a short gentle cast to put the fly ever so softly at the head of the pool. The dry shimmied as it drifted to the center of the pool, then was gone with the distinct plop of a slurping brown. Feeling the hook-set, the brown of about a foot long twisted on its side to splash the surface then went for the crevices at the bottom of the small pool. Okay, I got the trout, but now what? I hadn’t planned ahead for the unhooking portion of the procedure. The pool was just out of reach for me to just lean over and grab the fish, and the terrain too broken for me to climb over the falls to the pool above. I let the brown tug at the line a little as I thought it over. There was a good pool below the falls, so I urged the fish over the falls, thinking to get it from there. In the tumble over the falls the fly came free. I imagine Big Brown, who used to live in the upper pool, is still trying to convince his laughing little rainbow friends in the lower pool that "No, I didn’t fall out!" and telling the strange story of his abduction by a hairy bug that was strong enough to drag him around and over the falls. The next day was reserved for backcountry. The morning sun was well up when we parked the car at the trailhead, but the steep hills kept the rays hidden. The forest was bathed in the diffused blue-green light of early fall, when foliage is deep olive and mists from the cold nights dissipate in the warming daylight. At the end of the road we took the trail. At the end of the trail we kept going, more or less following rabbit paths along the creek. It was obvious we were headed for a place where few tread. We navigated the undergrowth, often backtracking to get around tangles, avoiding it where it ran alongside a cliff that grew ever steeper and higher. Just a couple of miles in we stopped at a beaver pond. The forest around was like a wall, the pond a hole in the middle of a tangle of trees on the side of the mountain. Tiny late wildflowers skirted the pond’s edge. It looked more to me like a big puddle, but Denver insisted there were little brookies in it. I studied the still water and saw some movement like frogs kicking about, but as Denver cast the red Humpy out into the middle, it quickly became apparent that frogs they weren’t. We caught several brook trout, aiming our back casts between the trees and over the thick brush that surrounded the little pond. I wondered if there was anything so beautiful as the stylish markings of the wild brook trout… spunky little guys that, while small, are confident enough to say "Hey, I’ll wear whatever I darn well want to!" A large crash in the woods near the pond made us both look up and at each other. What the…bear? Lots of those here, they say. I was torn between making racket like they say to alert the bear to your presence, and remaining still in the hopes of getting a cool photo. I opted for nursery rhyme off the top of my head. "Fuzzy Wuzzy was a…" I shouted, then cut myself off as the verse did not seem appropriate. Denver just looked at me with a grin. Leaving the bear to his breakfast nook, we continued on through the brambles further up the mountain. The makeshift path we followed took us high above the creek, and we caught little glimpses of it here and there through the trees. The higher up the mountain we went, the more inviting the waters became, until we clambered through the undergrowth to start working up the creek. We broke through the brush and stepped out onto the creek bank just as the sun’s rays were working their way through the trees to highlight the small pools and riffles. A golden moment that made us pause and look for quite a while. A few deep breaths of clean mountain air, adorned with the smells of clear water over rocks, ferns, and forest filled me with energy and immediately I was connected to this remote, wild place. It’s the kind of feeling you wish you could tap into when things get tough in normal daily life. We geared up, Red Humpies at the go with a little floatant. 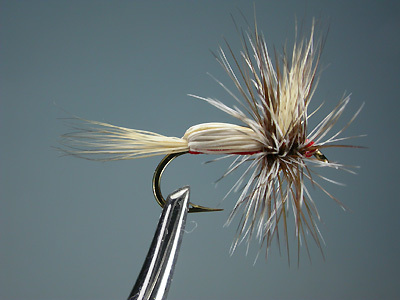 Not only did the trout like them, but also they were ideal for this small stream work, floating high and easily seen. We leap-frogged up the creek dropping the Humpies into pockets no bigger than beach balls, riffles and runs down to about a foot wide. Seemed like every one held a wild trout. We could cast normal if we wanted, but in so doing, we would lay the line across several likely holding spots, so a short roll that simply laid the line out in front was most often sufficient. Wild trout… full of energy and color, with a distinct zeal for life. I would drop the Humpy onto a narrow, swift run right at my feet. The fly would zip by me on the choppy water and get smacked by a feisty brook trout hiding in the shadows among the rocks. Quick, sharp responses the way nature intended for high-country survivors. Out of the pools and larger runs the wild rainbows would leap and fight at least as hard as domestic trout twice their size. From the deeper pools, the occasional wild brown would come up to nab the Humpy and take it down among the granites, bulldogging against the weight of the rod. To me, this was fishing nirvana. The fish were small, but they were plentiful and extremely fun. No easy wading on a flat river bottom here, or following a well-used trail… I’d fish an area, then rock-climb and bushwhack my way around Denver so as not to disturb his fish to get to the next area, usually a "level" up the stair-step nature of the creek. Then he would do the same. No signs or sounds of humanity. That high up and that far back there wasn’t a single piece of litter, or even a human footprint before us. The sun was warming, the forest shade inviting, the air refreshing, the Red Humpies productive. Checking the topo map at lunch we decided on a time to start heading back, to give us enough daylight for a safe traverse through the wild terrain. We continued on, toying with the wild trout, delighting in the plunge pools and waterfalls, occasionally meeting up to fish together and swap stories of the last few fish caught. Near the time to start hiking out, we met up and fished a particularly larger pool formed by a series of waterfalls. It was deep enough that the bottom was hidden and promised perhaps a nicer fish. I had a nymph tied on to try in the plunge pools, so I cast that at the entry of the waterfall, as if a natural just got dumped. Three casts and I got hooked to what felt like a wild brown, but it worked itself free shortly. Figuring that three casts and one fish was inefficient here (the Humpy generally got hits about every other cast on average), I told Denver to fish the pool while I put my Red Humpy back on. Denver took up a good position, worked out enough line to cover the larger pool, and made a picture perfect cast to light the fly near the falls. Something about the whole scene was nostalgic, so I just watched him. The humpy bounced on the choppy surface, and then began to drift out into smoother water nearer the edge of the pool. Suddenly the water exploded under it like somebody threw a firecracker in. Bright orange and gold showed through the flying water and Denver let out a yell. I got as far as "Holy…" and could say no more. The brook trout flew and dove, then somersaulted, until finally Denver had it in hand. Easily the best brook trout of the trip, and in this water this high up, an impressive fish. The colors would have made Van Gogh blush for shame. I ran over with the camera to get a picture and we looked the trout over for a few brief moments. Exquisite markings and a well-fed belly, it awed me to think that this glorious creature was born here, survived the winters and avoided all the predators, and now came to us as if to top off an especially wonderful day of fly fishing. Denver released the brook trout and it swam back to the foot of the falls with an air of grace. We agreed that this fish, this moment, was the pinnacle of our trip to the Smokey Mountains. All the beauty, the wildness, the energy, all wrapped up in a burst of water and color. There are some days and some brief moments that stay with any fly fisherman. Those moments when you feel at peace with the world, you feel connected to nature and its cycles. Moments such as this that make all other matters mundane and mere side steps until a similar moment arrives at some further junction. I need only to look at my Red Humpies to remember that trip, that day, that one explosive moment. Like the scent of distant wildflowers on a mountain forest breeze, I can pull some of that feeling to help refresh the soul. It gets me through until I can return to the mountains and their wild trout.